Happy Hump Day! I’m coming at you at a slightly later point of the week than planned as alongside this weeks regular working week I have been writing up text for some VERY exciting projects our wedding has been picked up for! I am keeping it zipped for now BUT you haven’t been forgotten, well who am I kidding you probably didn’t notice but a girl can dream. Today, it’s all about the boys! So pop the kettle on, grab todays advent choccie or scrap that grab the whole biscuit tin and settle in for some MANspiration. 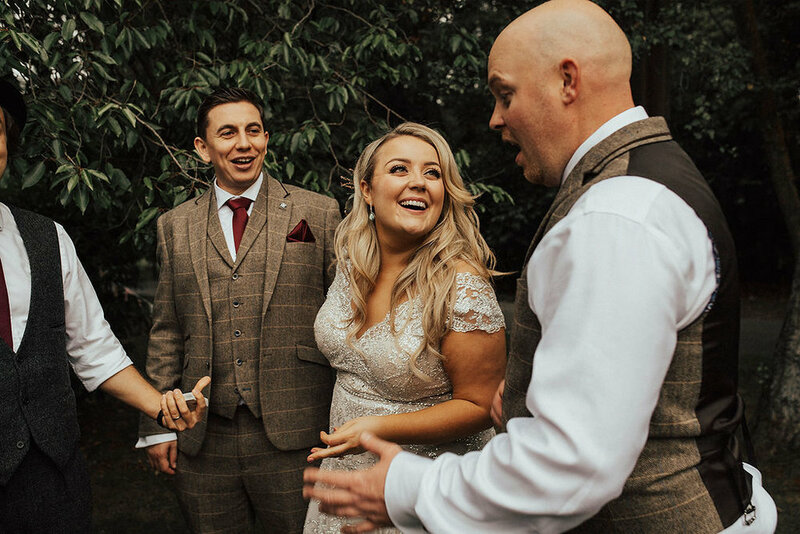 Now, I spend a lot of time talking with brides to be and I know a lot of ladies like myself despite managing to choose a wedding dress and let’s face it plan the MAJORITY of a wedding without needing to call on their groom to be for help, for some reason the blokes just can’t handle it. Rob was no exception and when it came to suit shopping for both himself and the rest of his squad, he immediately crumbled under the pressure and insisted I went along with him. Sound familiar? I bet! Although, I must say my inner control freak didn’t mind too much at all! ..and so at the start of this year we set out on the first of a few suit shopping expeditions, expedition feeling like the appropriate term as did at times feel as if we were needing to climb Mount Everest (not even dramatic!). See we had a fair few suits to buy, 6 in total for Rob (Groom! ), his two best men James and Justin, his ushers- his brother Pat and my brother Greg and his father Paddy (My Dad had his suit made to compliment the rest by his tailor), and while we weren’t necessarily on the tightest of budgets we were completely naive to the cost of both hiring and buying suits in the wedding world. 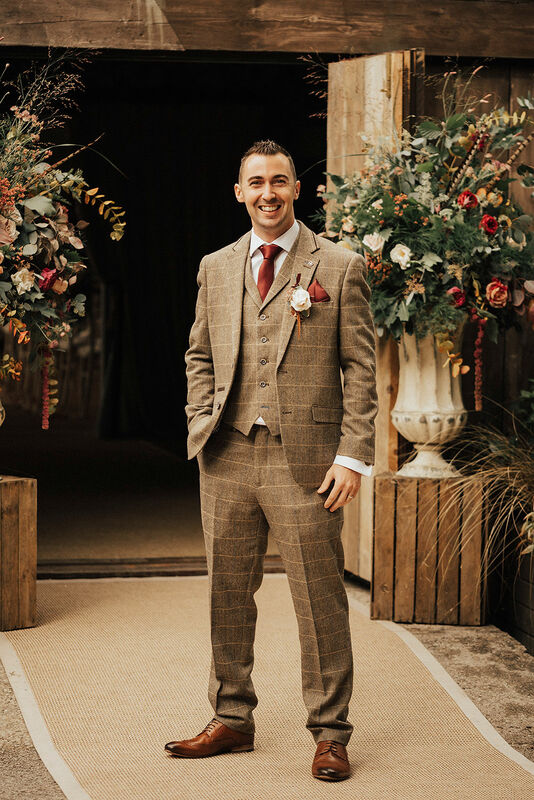 Rob has his heart set on tweed suits which suited his style perfectly as well as complimenting our “country luxe” wedding vibe. Feeling defeated after another day of suit shopping failure, it was on our way home we wandered past Venue Menswear in Leamington Spa and there in the window as if by magic was exactly what we were looking for- a three piece tweed suit. Half wondering if we were hallucinating and kind of never wanting to look at a suit ever again we braved heading inside and were greeted immediately by lovely Dawn who perhaps sensed our frustration and popped a beer in Rob’s hand and a glass of fizz in mine and miraculously we were back in business! The suits looked great and were really affordable. Feeling inspired we arranged for all of the boys to meet at the shop the following Sunday, they all looked and felt good and we weren’t in any way over budget. Result! 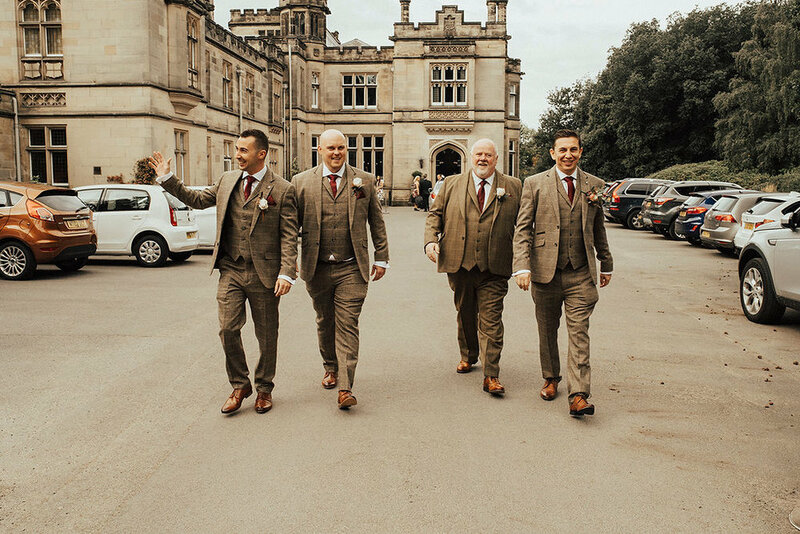 We teamed the suits with a shirt from M&S, burgandy ties and pocket squares picked up from Venue also and tan brogues, the boys were Topman and Rob’s a little bit more of a splurge from Ted Baker. 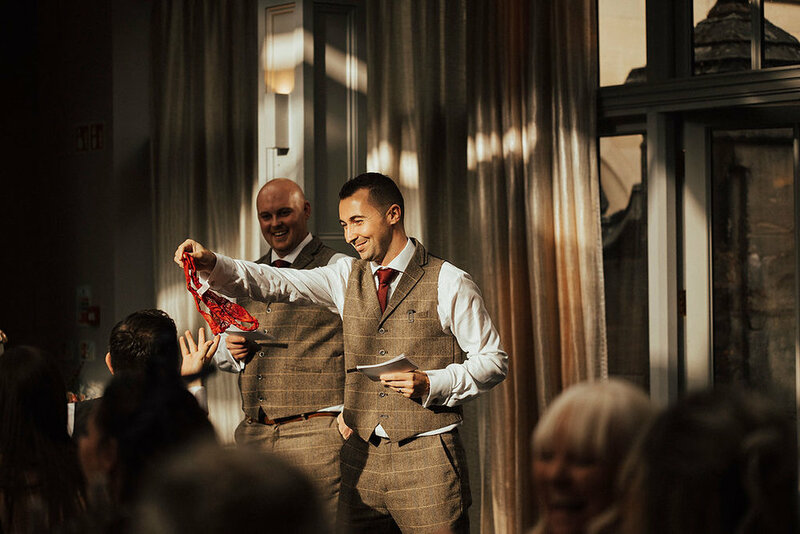 On the day the boys attire was made complete with a gorgeous buttonhole provided by our florist Lucy Walker (no blog post is complete without her!). These had a single ‘David Austin’ rose with greenery and finished with Pheasant feathers. Rob kept in his pocket my late Grandfathers pocket watch which my Mum dug out and had restored so that it worked for him to keep time on the day. 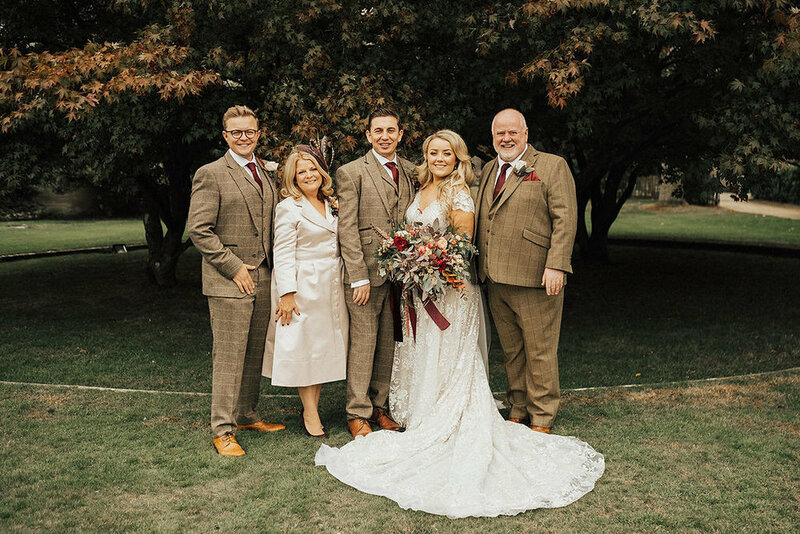 Rob felt like a peaky blinder and for my Mum and her sisters it brought back fond memories of my Grandfather with that very same watch on their wedding days. 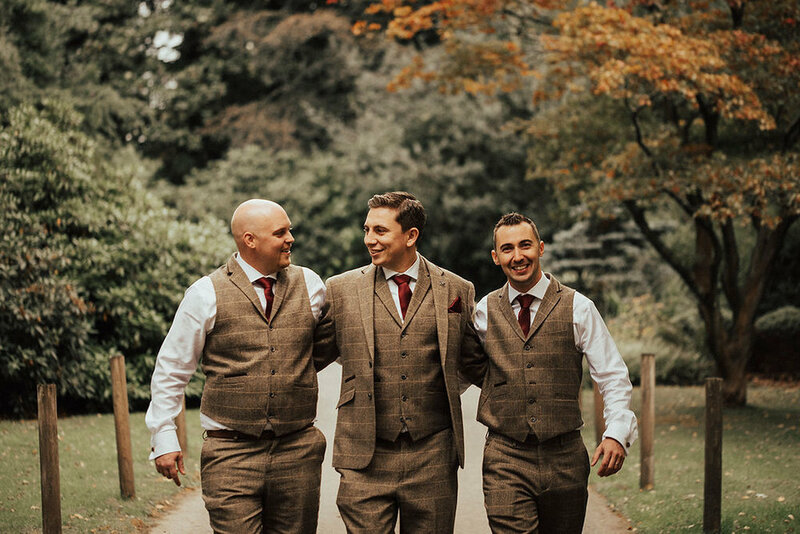 We ordered personalised gift bags from Little Wedding Treasures to house a few gifts we got for all of the men to say thank you for being a part of our best day ever. Inside we placed their shoes with a pair of burgandy socks from The London Sock Co, a “Team Groom” hip flask (..and stubbornly I picked up a “Team Bride” hip flask for my Dad and Brother so they couldn’t forget which side they were on!) from Paperchase with a little something to take the edge off any nerves on the drive over. Finally we treated them all to a pair of solid brass cufflinks from Man Gun Bear, engraved with various sentiments as a memory of the day and presented in the most beautiful leather pouch with their initials on. I came across this company on Not on the Highstreet and was immediately taken with their quality and style. That’s enough about the big boys, we had two little cuties on the day who most definitely and deservedly stole the show as our page boys- our nephews Patrick and Jake. They were the happiest little chappies and we were so proud to have them play a part in our wedding squad. 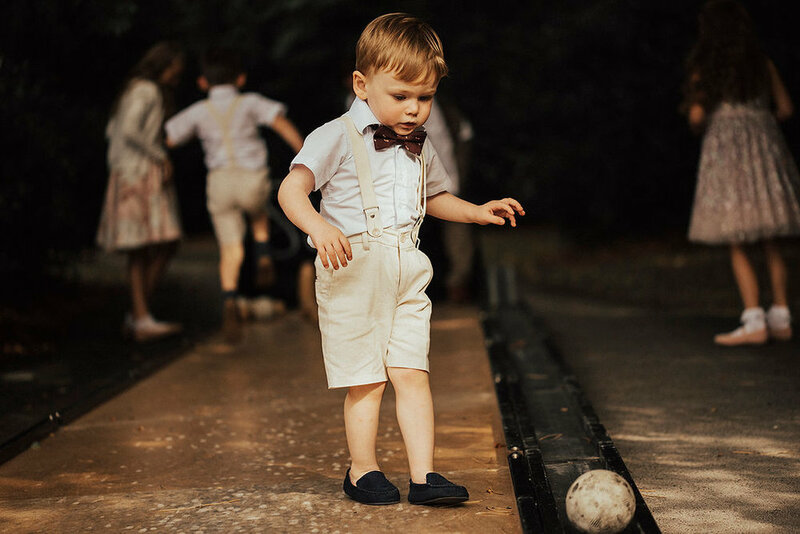 The boys melted hearts all over the shop in their adorable linen shorts, shirt and braces sets picked up from Baby Magic Dress through Not on the Highstreet. The set did come with a sweet matching linen bow tie but I came across some little burgandy bow ties with foxes on that made my ovaries do a little dance and enter my card details immediately. Their outfits were made complete with navy cardis from H&M and navy suede brogues from NEXT. SO damn cute! So that’s it! The boys in all their glory! They all made me laugh, they made me cry (good tears) and as always made me incredibly proud and thankful to have them in my life. See you for the next one on Friday. It’s a big’n!- Styling! Don’t forget to check in and thank you as always for reading! All product links hyperlinked into above text.